Discover Angers through your children’s eyes by testing the many activities on offer at Angers’ cultural attractions. The Château d’Angers is an enormous playground for children and its regular workshops and special kids-oriented visits are ideal for young visitors. Your wannabe adventurers can discover the fortress and the nearby area by looking for clues in a treasure hunt game. What a fun way to learn more about the city! Collect the game at the Tourist Office or download Baludik, a digital treasure hunt application for your mobile. Become an explorer at the Terra Botanica park! This park has plenty of activities designed for kids, but parents are sure to enjoy them too. Step up to the challenge and take part in the quizzes and games found throughout the park. There’s a living farm, the little elves’ world, a 4D cinema and much, much more... the hardest thing will be trying to see it all! Whatever you do, make sure you experience this enormous world of plants together as a family. What better family activity than a fun ride on a mini train? Set off with your children for a guided tour through the centre of town. Enjoy a pleasant ride while admiring the many landmarks along the route and listening to interesting facts about Angers. The mini train is a good alternative to sight-seeing on foot and will please visitors young and old. In the good weather, go green! 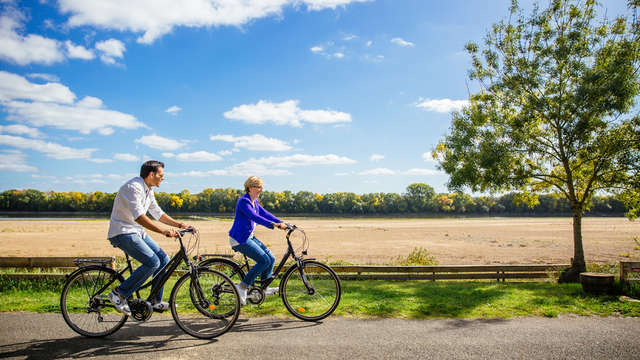 As France’s greenest city (UNEP ranking 2017), Angers is the ideal place for a family picnic and a bike or scooter ride around the Lac de Maine. There’s also greenery to be found in the centre of town. Take your children along to the Jardin des Plantes to discover the extraordinary trees. You’ll no doubt spot red squirrels jumping from one branch to another. A little further from the centre, there’s the Parc de Pignerolle. The vast spaces around its châteaux are the perfect place for letting off steam. Make the most of the play area and don’t forget to take a ball or rackets along for a spot of sporting family fun. Every year in summer, you can stroll around the imaginative entries in the themed gardening competition ‘Jardins d’Expression’, some of which are even created by children. For a fun and cultural afternoon, nothing beats a trip to one of Angers’ museums. Find out about the activities organised by the museums – your children will definitely be inspired by the themes. When it comes to museums, you will be spoilt for choice. Budding artists will like the Jean Lurçat and Contemporary Tapestry Museum where they can discover the art of tapestry or the Musée des Beaux Arts. The Galerie David d’Angers also offers a large array of activities for children in the midst of its impressive sculptures. At the Museum for Natural Sciences, you’ll discover animal species with a game and puzzle booklet. Kids will have heaps of fun while at the same time enjoying the works and artefacts on show at these museums. Find out all about France’s last ‘wild’ river with a trip to the educational Loire Odyssée visitor centre. Help your children answer questions about the river and test their speed with the interactive ‘flooding house’ game which simulates a flood. Loire Odyssée is an original way to learn new things while having a good time. With compass, lamp and binoculars, your dear little ones will be thrilled to play the role of archaeologists during their visit. Guide them so that they can complete the proposed missions in the form of games and riddles. Designed to suit the different ages of your children, the contents of family visits offer a multitude of activities around the Collégiale Saint-Martin, they’ll be kept interested throughout their entire visit !